Beginner/Intermediate. What cat doesn't need a fez? Beginner. If your dog loves to play catch or tug-of-war, you don't have to settle for a store-bought toy with this knitted favorite. Intermediate. 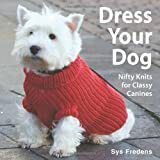 With this Fun Fur and Wool-Ease sweater, even your pooch can strut in style. Beginner/Intermediate. It's a bumblebee on a cord to drive your cat crazy. Beginner/Intermediate. A cute yarn catnip wonton that your cat will love. Purr. Intermediate. A cute little doggie sweater.